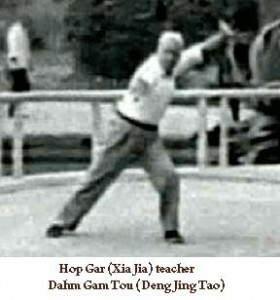 Hop Gar (Xia Jia or “Knight Style) is one of the few Kung Fu styles originating in Tibet. Also known as Tibetan White Crane, its origin legend speaks of a monk named Dai Dot (Ah Dat-Ta) coming upon a crane being attacked by an ape. Powerful and impressive, the ape attacked with wide swing arms motions yet was still unable to capture the crane who ducked and dodged with grace and agility. Finally cornered, the crane turned suddenly, struck the ape in the eye then escaped. Instantly enlightened martially the monk developed a style he initially called See Hor, Tibetan for “The Lion’s Roar” a term for enlightenment and the call of Buddha. It was known by this name for at least three generations. At the fall of the Ming dynasty (1644) the Manchus conquered China. Historically these people were allied with the Tibetans. The position of Tibetans in Chinese culture was thus instantly reversed going from a lower cast to an upper with the conquest. Tibetan monks, renown for their great fighting skills, became extensions of the Manchu power base. In keeping with their religious concerns they generally were utilized as teachers rather than actual fighters and trained their students in a temple build by the Manchu overseers. At this point the style was most commonly known by its second title,� the Chinese phonetic equivalent of the Tibetan term: La Ma or Lama style ???. After much training Wong inherited the Lion’s Roar and also became a master swordsman. Embarking on a career as a body guard he often guarded the rich and the powerful. Though bandits terrorized many in those days, they stayed away from Wong’s protection. Eventually he was known as a “knight” and the style he practiced was Sinicized to Hop (knight) style and given the name “family” or Gar as is often the case with styles in Southern China. To further his name Wong built a Lei Tai in Canton and challenged all comers. He was attempting to raise money for his new school. In the week’s time he is said to have bested 150 challengers. After this he was instrumental in organizing the famed Ten Tigers of Canton, with Wong himself the “No.1 Tiger”. Further information suggests more about Wong’s history and has him traveling to a small village on the Tibet/China border by the name of Ching Hai. Here a Lama named Ng Muy has raised four fine students named: Kup Duk, gai Bai, Ling Ohn and Fan Tiu. Then one Hing Duk became Ng Muy’s last student. It is said that when Wong Yan Lum stayed at Ching Hai village he learned from Hing Duk. Wong developed two famous disciples. The first, Wong Lum Hoi, helped with the studio and made a living from it. The other, a rich man named Choy Yit Gong, eventually became the body guard of Dr. Sun Yat Sin. This probably indicates some connection between Choy and the famed Hung League which backed Sun. As the years passed Wong Yun Lam became blind. His disciple Wong Lum Hoi� ran the school and supported him but had little time to visit his master who lived outside town. Soon he began sending a dedicated, though poor, student to do errands for Wong Yun Lam. 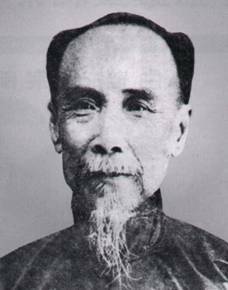 This man was named Ng Yin Ming. At the time he entered the school he was a regular performer in Chinese opera and about twenty years old. But, being poor, he was not allowed much Kung Fu information at his school. However, after frequent visits, Grandmaster Wong took him under his wing and personally instructed him by listening to the sounds Ng made by� practicing. For eight years Wong taught Ng late at night, after his performances. The style he taught was different from what Ng learned at the school. Grandmaster Wong informed him that it was known as Hop Gar. At the end of this apprenticeship, in the year 1928, Ng’s opera troop went on the road. Ng often supplemented not only his income but his reputation by demonstrations of his fighting skills. This went on to 1935 when Ng moved to the U.S. Three years later he joined the group of pilots that would become world famous as the Flying Tigers. He joined the Chinese National Army Air Corps in 1941 as a fighter pilot. After the war he became the body guard and personal pilot of General Ku Ding Haw. He also ended up teaching Ku’s son, Chi Wai, the Hop Gar style. Around this time Ng also met one monk known as Law Wei Jong. Many years earlier, around 1910, Law had actually escoted Sing Lung, then a very old man, around his temple. Sing Lung had kindly taught Law the Five Elements Qigong of Hop Gar. Ng Yim Ming passed his art to a number of people. One of his students, Ku Chi Wai, has a studio in Atlanta and Los Angeles. Also the well known David Chin teaches in Fayettebille, North Carolina. In the Netherlands Hop Gar is represented by teacher Kong Fan Wei. Here are additional linege notes. Chon: To destroy, so the enemy cannot continue. Sim: To evade, and not block. Chun: To penetrate the space between attacks. Jeet: To intercept, before opponent completes. Note from Ted: I conducted a personal interview with David Chin more than 30 years ago. Originally it was earmarked as an article for Black Belt. We had a memorable talk all the while flanked by an obvious body guard dressed, I will always remember, in a blue suit and a pink tie. We ate at the booth, he ate at the counter. I remember a definition David mentioned, “Animal styles are not like this,” imitating a crane movement. “It’s attitude. Animals don’t do this technique then that. When you put you arm out they tear it and bite it. It’s all meat to them. Not stategy.” This was the fierceness of Hop Gar as he saw it. Posted October 13, 2006 by Plum Staff. Comments and trackbacks are open. Follow the comments feed.